What shape will look best? What size should I get? Sometimes you need a little guidance when choosing a size for the area rugs in your home. We’ve come up with some helpful tips to make the process a little easier for you. 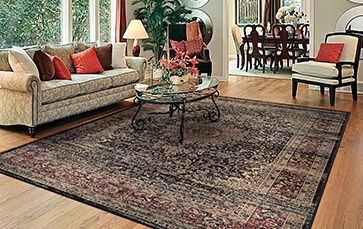 Be sure to carefully measure the area in your house where you are placing an area rug before purchasing. 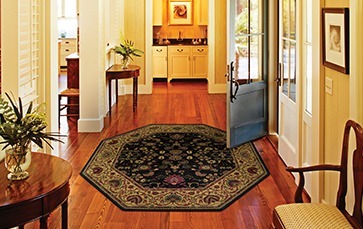 Use a tape measure in order to determine the correct size of the area rug. You want your area rug to fit your designated space properly, but also make an impact in your setting of choice, too small and your area rug may get lost in the overall aesthetics of the room. Consider the room’s activity – is it a high-traffic area? If yes, it’s best to have an area rug that’s both resilient and effortless to care for. The most common area rug sizes are 4’ x 6’, 6’x 9’ & 8’ x 11’. Use your table and chairs as your guideline. Your furniture, including when chairs are pushed out, should all fit comfortably on the area rug. Leave enough space so that the area rug extends beyond the back legs of a chair when your guests are seated. This is critical as your chairs may wobble on an uneven surface. 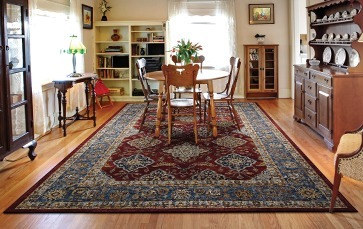 An 8’ x 11’ area rug is the most common size for a dining room. 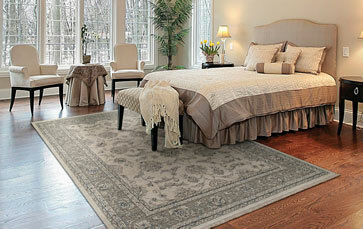 If you want to put an area rug under the bed, be sure it extends a few feet around at least the sides of the bed. To frame the whole bed, have an even amount of area rug showing all around the bed. Roll runners are also a great option for bedrooms. We suggest picking an area rug that extends past the coffee table and under the first set of legs on your couch or furniture. It’s ideal if the area rug is at least the same width as the couch. General rule is to have 12 inches of flooring space. The bigger the area rug the better chance of making an impact and better chance of bringing all the décor elements of the room together. 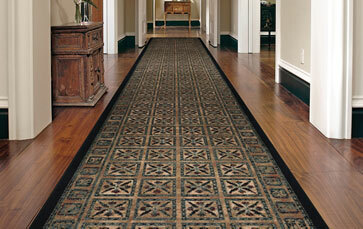 Roll runners are perfect for your hallway. A good rule of thumb to remember is to keep six to twelve inches of flooring space exposed on either side of your runner. For an inviting entry, measure the width of your home’s entrance and choose an area rug that will take up a majority of the space. Special shapes such as rounds, squares and octagons will provide dimension.